Controversy doesn't prevent Peter Moss' Triumph at World Open! Peter Moss, a hulking muscular man of about 6-6, 230 pounds, once took athletic prowess onto basketball courts and competed amongst the world's elite players. While Moss still plays, some of his energy has been redirected to another passion of his… chess. A Philadelphia native, Moss entered the World Open tournament (Under 1800 Section) with dreams of placing among the elite of his class. This dream was nearly derailed when a terrible controversy rocked the entire playing hall. 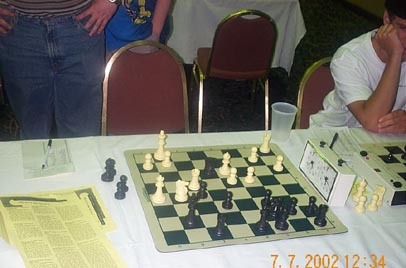 The incident began when Moss noticed with suspicion that his opponent Aleksander Vayserberg would leave the board only to be tailed by a person who was obviously paying close attention to the game. Both players were at 5-2, so obviously this was a crucial 8th round game. In the game, Moss was on the ropes and on the verge of being mated. In fact Moss pointed out that his opponent had missed a mate in two! After Vayserberg left the board to go outside, Moss waited for a few seconds and then followed with his clock still running. Moss stepped outside to find his opponent speaking in Russian to the same man intently watching the game. The person speaking to Moss' opponent was Aleksander's brother, Yevginy Vayserberg, a participant in the unrated section of the tournament. It was then that Moss became infuriated and began shouting about a cheating infraction. Moss was so upset that he banged on the glass doors. During this loud confrontation, about 30-40 players rushed outside to see what the commotion was about. Moss continued shouting and when Vayserberg denied cheating, he replied, "Do you think I was born yesterday?!!! You were discussing the game!!!" The Tournament Directors came out to quell the dispute, but it did nothing to calm Moss. If anything it made the situation worse. Moss also replied in his anger, "I only want to play him (Aleksander), not the whole Soviet Union." Eventually, Aleksander slipped and admitted that he discussed the last move in front of 30-40 onlookers! Knowing that he had made a mistake, he sought to change the story to discussing his brother's recently ended game. 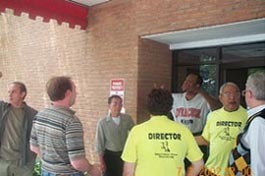 Peter Moss (Syracuse shirt) accusing Aleksander Vayserberg (striped shirt) of cheating. Yevginy Vayserberg at far left. 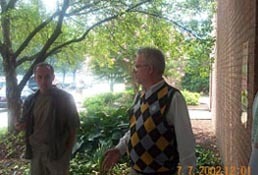 Bill Goichberg came out and puzzled the crowd by saying that he needed a preponderance of evidence to penalize the culprit of the alleged infraction. This was despite the fact that 30-40 onlookers heard Vayserberg admit to cheating. There were several impartial onlookers who emphatically demanded a forfeit disqualification. It was only when Moss mentioned that Yevginy was looking at the game for approximately 10 minutes did he rule a disqualification in Moss' favor. Aleksander then resigned the situation and said that he would forfeit the game and even said, "No problem." Bill Goichberg inquires about the incident and further questions all parties present. Apparently justice was served here, but the question remains, "How much cheating really occurs in these high profile tournaments?" While Moss did win his last game and finish with a prize-winning 7-2, a deeper problem has been revealed with respect to both cheating and conflict resolution at chess tournaments. Perhaps there needs to be something else done to prevent the creative cheating (e.g., pocket computers, collaboration, fixed games) that has gone on. This has all been said before, but what if Peter Moss was not as alert as he was? Editor's Note: Several years ago, tournament guidelines in the World Open had to be adjusted due to "sandbagging" FIDE-rated foreign players who would play in low sections and walk away with thousands of dollars. Of course, this wasn't cheating, it was merely a fault identified in the system. In this case, one can say that the Tournament Directors (TDs) were at fault for being unable to handle the Vayserberg-Moss conflict, but this isn't completely fair. Unfortunately, TDs are not trained in human conflict resolution and frankly do not know how to properly deal with certain contentious situations. This issue as well as the one with Akeem Gregory-Thompson should have been dealt with on a social level when mere explanation of rules is not enough. It would have been a travesty if Moss (a personable young man) would been carted off to jail for destroying property in his anger. Perhaps it is time to look at a change in the way these conflicts are handled and the way TDs are trained.